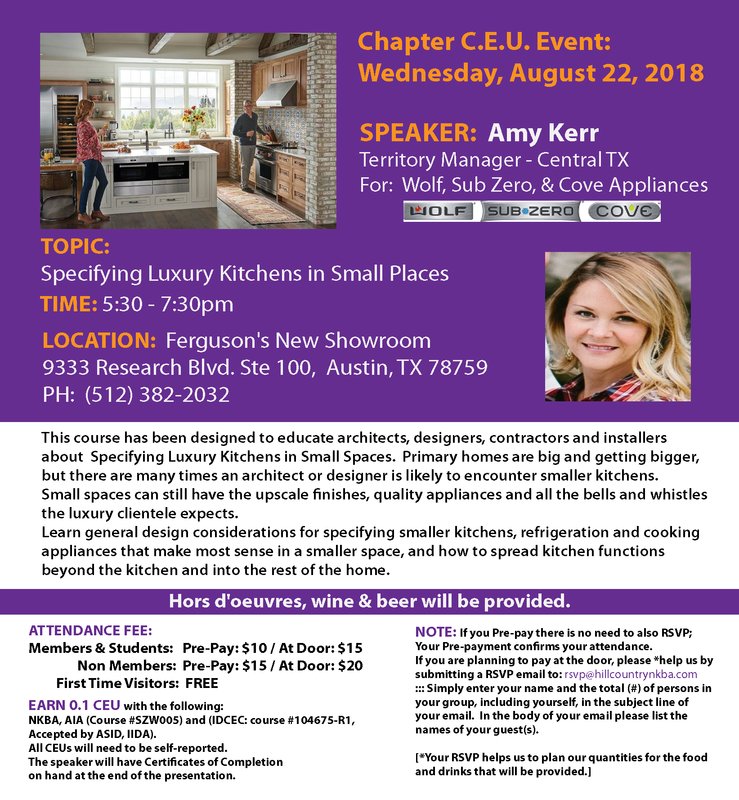 NKBA Texas Hill Country is the local chapter that brings together local Texas Hill Country Kitchen & Bath distributors, retailers, remodelers, manufacturers, fabricators, installers, designers, and other professionals – and provides a resource for local consumers to research, educate and connect with Texas Hill Country Kitchen and Bath professionals. Click here to visit the NKBA Texas Hill Country website. Click here to visit the NKBA Texas Hill Country Facebook page. Be sure to bring plenty of your buisness cards. 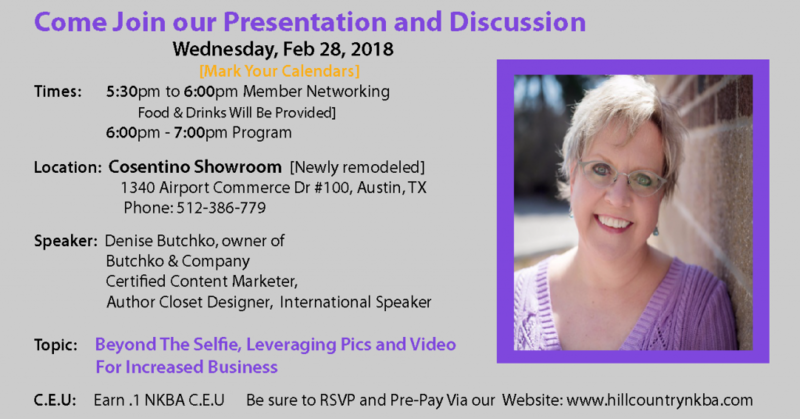 In the second section the floor will be open to a Q&A session regarding any questions you may have regarding any realms of our kitchen and bath field, your business , your urgent ‘911s’ , our chapter or the NKBA. The Q&A panel moderators are: Ines Lombardi, (CKD) of Lombardi Interiors; Lucy Katz (CAPS) of Katz Builders; and the owners of Kitchens & Baths of Austin, Eve Barnes (CKD) & Kent Barnes (CMKBD). 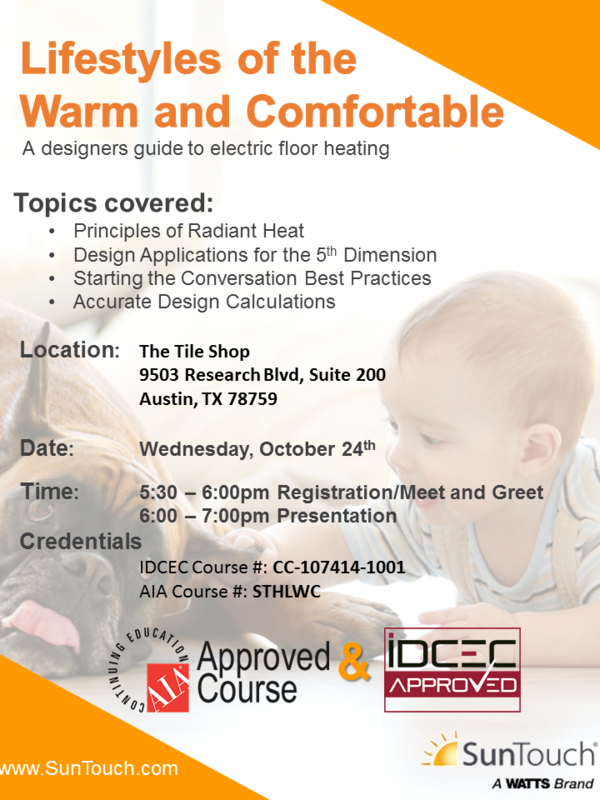 A Designers Guide To Electric Floor Heating. Is the relationship between a contractor, architect and interior designer one of competition or cohesion? Christopher Grubb explains how today’s industry professionals should build mutually beneficial long term relationships in order to implement an unforgettable design experience for the client. Having successfully cultivated relationships with contractors for over 25 years, Grubb explains how these solid working relationships provide many benefits to the overall project, often saving time, hassle, money, and even the contractor’s reputation. 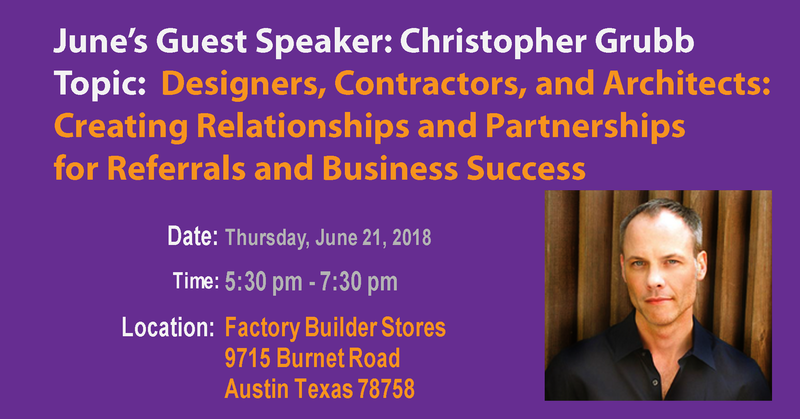 Attendees will learn how interior designers, architects, and contractors can work together to create seamless experiences for clients, as well as increased success for their individual businesses. 1. Understand what services designers can offer contractors, and vice-versa, in order to produce successful projects and protect each other’s reputation. 3. Comprehend the benefits of having a designer help clients select products and finishes, as well as discuss material costs, leaving the contractor free to focus on vital construction details. 4. Learn how to cultivate long-term, mutually beneficial relationships that can lead to increased profits for both parties. 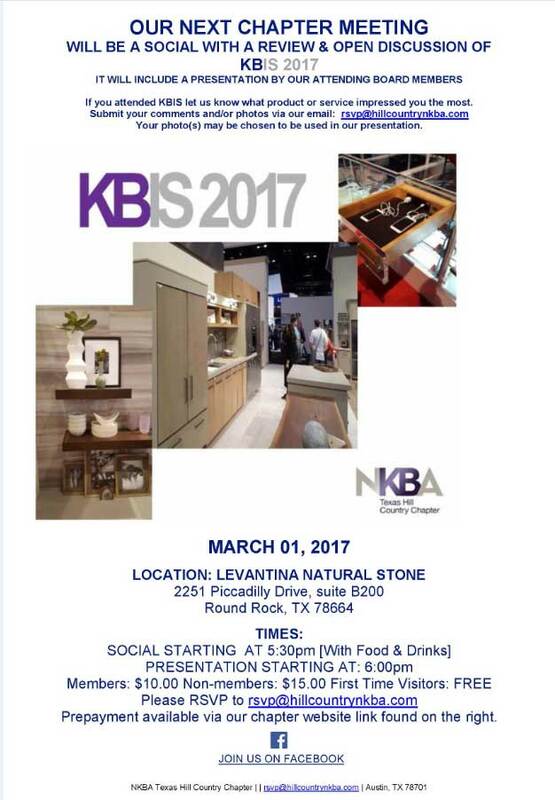 Texas Hill Country NKBA is proud to invite you to our seminar that features the story of natural stone in a variety of ways. 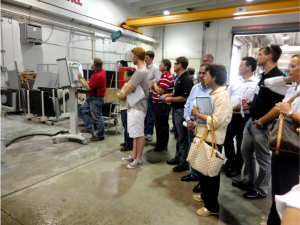 A tour of the Levantina warehouse that houses numerous beautiful slabs is included. Witness a 10 minute video showcasing the history of stone, modern day quarrying techniques, and stone’s durability, beauty, and value. Learn and discuss landscape, interior and exterior use as well as application of natural stone. Obtain more information about the use of sandstone, bluestone, limestone, and quartzite for hardscapes, as well as the interior use of limestone, marble, granite and slate. Study the use of limestone for trims, caps, stoops, pool copings, water tables, veneers, and much more. Learn the importance of how safety in production practices is a key part to the stone industry. exterior use and application of natural stone. tables, veneers, etc. into your designs. equipment used to fabricate stone. The visual aspects of your work as a Kitchen/Bath designer are top priority. So learning ways to get those visuals and then LEVERAGE those visuals moves marketing forward by leaps and bounds. From Facebook to Instagram to YouTube to your website to Houzz, using pictures and videos of your work will bring you – guess what – more work! If you Pre-pay you do not have to also RSVP. Bring your friends for a great night of fun! Attendance Price: $35.00. Includes: food, drinks, and 5 tokens to play with. Getting to Know Everyone Social! Join Jonas Carnemark, CR, CKD, for a practical nuts and bolts seminar on how to create award-winning designs without breaking the bank. You will learn how to guide your high-end clients into making the right choices with their money. Jonas will share his insights on how to build client trust using tested principles of value engineering to create outstanding kitchen and bath designs. Discover how to delight your clients while creating compelling marketing opportunities for you and your firm. From Measurements to Concept, Understand How You Can Rise Above Your Peers! Proceeds from this event will be donated to the local charity organization Mobile Loaves and Fishes. Tables provided: Black Jack, Roullette, Craps and Texas Hold’em Poker. Attendance Price : $ 35.00. Includes: Food, 2 Drinks, 5 Tokens and loads of fun! This will be a great opportunity to see the new Expressions Home Gallery. Houzz and the Internet have forever changed the way the prospective clients discover and hire professionals for their projects. Old models of working with clients no longer work, as modern day clients have the Internet at their fingertips from the first moment they begin to think about remodeling. During this session, discover how you can and must leverage new tools to successfully close business at every stage of the traditional sales funnel, from consideration, to credibility to the final stage of the sales process. Understand how technology has changed the way homeowners are finding information about projects and professionals. Learn how to shorten the cycle, compete on brand rather than price, and reach clients in entirely new ways. Learn how to establish a compelling online brand that differentiates your business. Learn how to use tools and technologies that enable you to close new business with prospective clients at every stage of a traditional sales funnel. Attendees will be eligible for 1 CEU w/ NKBA and NAHB. This should be a great opportunity to learn, network and socialize. We do hope you will attend! Hello chapter members! During our next meeting there will be a presentation presented by the cabinet hardware manufacturer, Hafele America Co.
You will see the best and newest ways to open cabinet doors – all without hinges. Learn why and when to specify any one of Hafele’s Five Dynamic Cabinet Door Sliding Systems. The presentation includes comparative sketches to establish understanding of benefits and differences and is also supported by animated layout drawings, pictures and videos of conceptual and built solutions. Attendees will be eligible for 1 CES LU – HSW credit. Course# ISKA1; an AIA Continuing Education Program. For more information, click here. This should be a great opportunity to learn, network and socialize! Drinks and hors d’oevres will be provided. We do hope you will attend! After a successful career as a business founder and CEO up in upstate NY, Karl sold his companies and moved to Austin, TX. Karl dedicated the next phase of his career to helping and mentoring business owners and executives to grow sales and maximize profitability. He opened Market Sense, a Sandler franchise that specializes in consulting and training people in leadership, negotiating, enterprise selling and general sales. Over 20 Market Sense clients have been named to the Austin Business Journal’s “Fast 50” list since its inception. In 2015, Karl was awarded the David H. Sandler award for his outstanding contribution to the Sandler network. Karl also teaches sales at the ACTON School for Entrepreneurship, and he is currently a member of the World President’s Organization. Hors d’oeuvres and drinks by Ferguson. Cost: $10.00 members, $15.00 non-members. Bring a friend. First time visitors and students are free.